Source dx.doi.org/10.1186/1471-2105-7-89 . Figure 6. 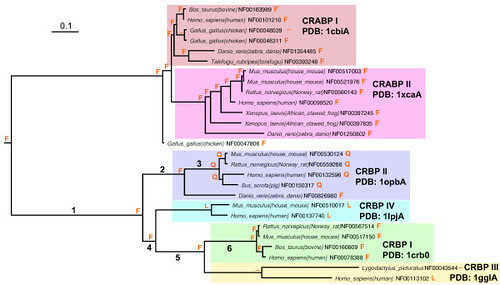 Phylogeny of retinoid binding proteins. 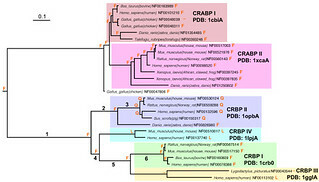 Cellular retinoic acid binding protein (CRABP) subfamilies I and II and cellular retinol binding protein (CRBP) subfamilies I – IV are boxed. Extant and ancestral amino acids corresponding to alignment site 7 (PDB:1opbA position 4) are shown at leaf and internal nodes.